One purchase that I made for our Home Office Makeover this week was this Threshold™ Brushed Silver Linear Floor Lamp from Target. I like the sleek & simple lines and industrial feel that comes along with it and it’s a perfect addition for the office. Super easy assembly too. I promise for some more detailed updates on our project soon. I know most people are focusing on the Big Game this weekend, and while I’m not much of a football fan (especially when our Steelers aren’t playing) I am DEFINITELY a fan of The Puppy Bowl. I just can’t handle the cuteness. Between the Puppy Bowl and some much anticipated commercials, I think this girl will get more than her fill of the football festivities! ‘Nough said. So, it may have been a slow week for me creatively, but my hopes are high for a productive weekend. What are some of your latest obsessions this week? Are you ready for the big Superbowl weekend? A good friend of ours asked me to help out with some ideas for their toddler’s room as he transitions from a nursery to a big boy space and I couldn’t be more excited to lend a hand! As I’ve been brainstorming ideas for a fun space that will last for several years, I have grown to love the concept of transitional kids rooms for toddlers that will last longer than just the “terrible twos.” I think kids rooms are becoming a whole lot less literal and a whole lot more design oriented. Themes that are more flexible allow the room to grow with the little ones and prevent you from having to switch up room decor every few years. Neutral colors on the walls, floors, and furniture let you add color with bedding, toys and accessories (the easy parts to change as your children grow) which can be swapped out quickly and easily as your child’s interests change. More flexible storage solutions like baskets and boxes allow easy clean-up and organization of toys and can continue being used years down the line. I love the idea of creating some DIY chalkboards or cork boards that can be used to learn shapes, letters & numbers and also display any artwork your kids might bring home. As they get older, these can be used to display weekly schedules, remember homework assignments, and highlight their accomplishments! Neutral base colors: Using neutral colors on the walls, flooring and main elements in the room will allow you to add color through smaller pieces (toys, books, bedding, etc.) that are much easier to swap out for new things in the future. Themes that can grow: When choosing a “theme” for your transitional kids room, try to go with something a little less literal. Try choosing or creating artwork that could work in a teenage room. For example, instead of a Lightning McQueen poster, find some cool vintage car prints on Etsy to frame and hang. This kind of artwork will grow with your kids and work in a bedroom long after the terrible twos. Using toys, books and accessories to add that childlike theme to the space, you will be able to add and edit whenever you need to and change them as your child’s interests change. Long lasting bedroom furniture: Buying nice, substantial furniture for your toddler may seem excessive at first, but will save you money and energy in the future. Buying solid and well-made furniture like a bed, dresser and storage units that your child will be able to use up until they leave for college is a great investment and one that you will appreciate in the long run. 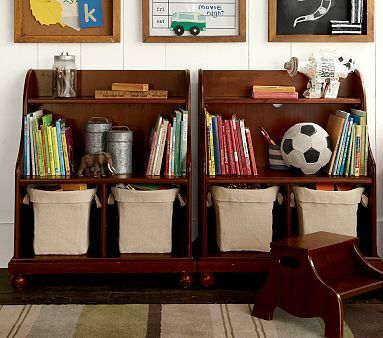 Smaller storage options: Additional storage options, like baskets and boxes placed on shelves, provides quick and easy clean-up and organization of toys when your kids are younger and can be used for other purposes as they grow. 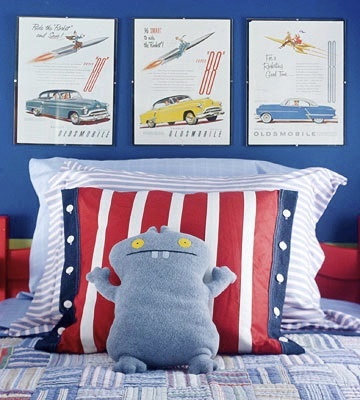 Age appropriate Textiles: One of the biggest statements in your child’s room will come from your choice of bedding. Go for fun, child themed bedding when they young. This is where you can insert the shapes and colors they are loving at the moment. When they have grown out of their Toy Story comforter or Kung Fu Panda duvet cover simply swap it our for a new one. This is the easiest way to change the vibe of the room without breaking the bank or undergoing a major facelift. Bedding, blankets, window treatments and other textiles in your child’s space is a simple way to age-up the space while your kids are growing up. Display Boards: Once project idea that I love for transitional kids rooms is DIY display boards. Creating chalkboards, corkboards, or magnetic boards to hang on your child’s wall will be a great way to learn and explore when they’re young and to display artwork, awards, and schedules as they grow. I’m excited to get this project started and can’t wait to fill you in on how our transitional kids room design is going! So, what are you thoughts on transitional kids rooms? How do you let your child’s room grow right along with them? For anyone who loves the Pens, watches hockey, or just appreciates cool photography, you have until March 2nd to check out this amazing exhibit here in Pittsburgh that documents the destruction of the old Civic Arena. How amazing is that picture? The exhibit, which is free, is open through March 2. Hours: 11 a.m.-8 p.m. Fridays and Saturdays; 11 a.m.-6 p.m. Wednesdays through Thursdays; 11 a.m.-5 p.m. Sundays. We will be checking it out for sure! In the midst of some major brainstorming for our home office makeover, I’ve come to love the idea of creating some sort of desk “backsplash.” This could be a great way to create some additional organization and add a little bit of va va voom to the blank space behind our desks. I like how Emily over at Recently used a chalkboard wall with magnetic paint in her desk nook to tie everything together. I’m also playing around with some other ideas, maybe some sort of cork board, for a little desk backsplash behind our desks. I plan on diving into that in more detail this weekend! With just two more weeks until the opening ceremonies for this years winter Olympic games (I have to say, I am a definite Olympic junkie..I swear, even curling get me going. Bring it on!) I can’t help but think of some Sochi inspired designs with a nod to the games without going full blown red, white & blue to help bring style to your home worth of a gold medal (Holy puns. Okay, I’m done)… Channel all the Sochi bound athletes with a vintage suitcase end table. Any old luggage laying around in your attic or basement? Stack ’em up or turn them into an Olympic inspired side table that’s sure to add some vintage style to your space. Not ready for some DIY action? Check out some of these luggage inspired tables on Etsy. Layla, over at The Lettered Cottage has a fun little segment called Pick My Presto where she interacts with readers to offer some design advice and redesigns of their own spaces. It’s a great example of how bloggers can interact with readers online and act as virtual designers! Have fun looking through some of her design ideas and hopefully pick up a few ideas of your own!